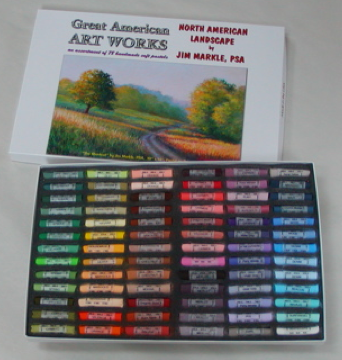 Great American, a manufacturer of pastels for the professional, markets this “Jim Markle North American Landscape” set of pastels. The set consists of 78 pastels selected by Jim for landscape painting. It is the basic set he uses in his travels and plein air painting throughout the U.S., Canada and Europe. Also available is a 60 “half stick” set. $270 plus $10 shipping cost for the full set, or $138 plus $8 shipping for the “half stick set”. Michigan residents add 6% sales tax.